For years, Libby Morgan dreamed only of making partner in her competitive, high-pressure law firm. She sacrificed everything for her career - her friends, her marriage, her chance at creating a family. When her boss calls Libby into his office, she assumes it will finally be good news, but nothing can prepare her for the shocking reality: she's been let go and must rebuild her entire life . . . starting now. With no job prospects in sight, Libby reaches out to old friends and spends her afternoons at A Good Yarn, the local knitting store. There, she forms a close bond with Lydia, the sweet-natured shop owner, Lydia's spirited teenaged daughter, Casey, and Casey's best friend, Ava, a shy yet troubled girl who will shape Libby's future in surprising and profound ways. As A Good Yarn becomes a second home - and the women a new kind of family - Libby relishes the different person she's become. She even finds time for romance with a charming and handsome doctor who seems to be her perfect match. But just as everything is coming together, Libby must make a choice that could forever change the life she holds so dear. Warmly told and richly textured, Starting Now is filled with the promise of new beginnings and the unending delights of companionship and love. 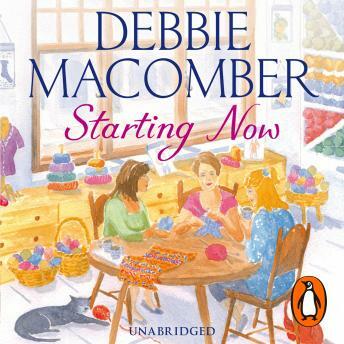 There is a knitting pattern included with this audiobook.